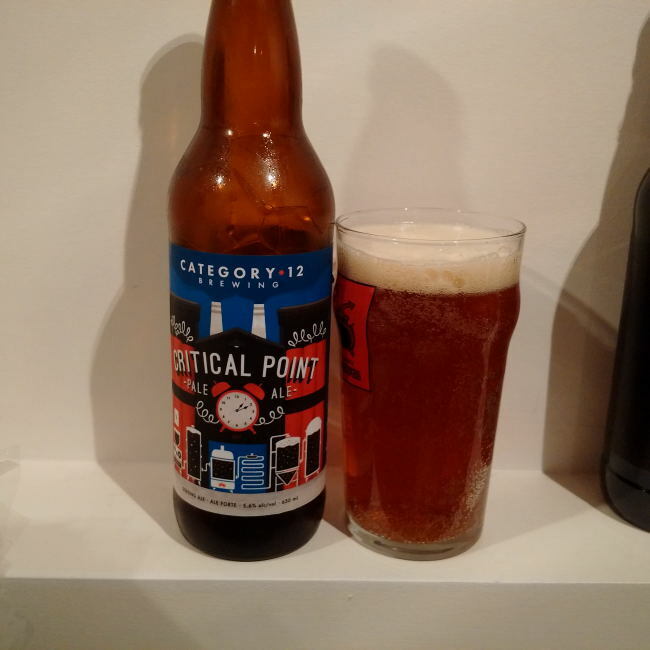 From the new Category 12 Brewing in Victoria comes their “Critical Point Pale Ale”. The beer pours an amber colour with an off white head. The aroma consists of citrus, tropical fruits, malts and a floral hops finish. The flavour is of citrus, tropical fruits, caramel, earth, pine and mild hops bitterness. The alcohol content comes in at 5.6%. I really enjoyed this beer and I am glad to see that Category 12 Brewing has started to ship to Vancouver. Commercial Description: The pressure is on. It’s going to take cunning to blend science with instinct and the clock is ticking. But timing is everything and precision is the only thing that matters. Confidence, analysis and art collide to create a perfectly balanced beer. And, when it comes down to the wire, success tastes even more satisfying. This true Northwest Pale Ale is all about timing. An emphasis on late hop additions with notes of tropical hops, Critical Point is extremely smooth. The alluring citrus aroma will draw you in and the well-rounded caramel finish will keep you coming back. This entry was posted in Pale Ale and tagged bc, bitter, bitterness, canada, caramel, category 12 brewing, citrus, citrusy, critical point pale ale, earth, earthy, hopped, hops bitter, hops bitterness., mild hops, pine, tropical fruit, tropical fruits, vancouver island, victoria.